After nearly a month's worth of public trials, on Tuesday, Brizzly finally announced the launch of Picnics - the newest approach to private group chat on the Web, leveraging the company's rich media roots and intelligent conversational UI found in their popular social networking client to give less public conversations a new home - even as other sites are continuing to peel back the layers of what is public and what is not. The result, a fun free-flowing environment to chat with friends, family and colleagues without fear of the content going public, and without the headaches associated with more feature-laden tools, like the much discussed Google Wave. While Brizzly is well known for their Twitter and Facebook client for the Web and iPhone, the company is branching out from being solely beholden to those two sites. Their Brizzly Guide explains the day's hot topics, and Picnics, which require a dedicated Brizzly account, take place outside of both networks. The concept of a Picnic is a private (or public, if you choose) chat with any number of people you invite. Updates are posted chronologically, with the oldest at the top, and you can add photos in line. Quoted tweets are displayed with a unique design, and hours can be wasted playing with the customizable Webcam feature, and its related effects. 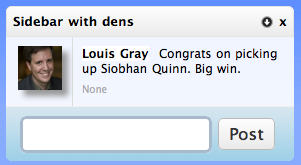 A Sidebar (Like a DM) With Foursquare's @dens on the Hire of @siobhanquinn. Before you say "Hey! Web chat is nothing new!"... yes, that's somewhat right, but Picnics are surprisingly useful. You can customize the people invited to participate, you can get e-mail notifications upon new entries, and can even start 1-1 sidebars with people involved in each Picnic, much like direct messages without the overhead. Brizzly's leading Web app capability to display photos in line is also a fun addition that brings us ages beyond the world of shared text windows. Brizzly's introduction comes at a time when Facebook and Google and others have been called on the carpet for violating privacy. They know this and said that the launch of Picnics puts "you in control of who sees what you say and where," adding "Have a picnic with your friends to post the funny YouTube videos you used to put on your wall." Meanwhile, Twitter, while it has improved, continues to strain under the pressure of one to many conversations, and lacks the potential for rich discussion in an intimate way that Picnics bring. So Picnics gets privacy right and it gets conversations right in a fun way. I've been using Picnics to talk with friends and family for weeks, and the debut is welcome. Check them out at http://www.brizzly.com. Mint.com is quickly turning into a single stop venue to not only capture your current financial picture, and graph how you are doing in terms of spending and savings from your financial history, but it is also helping you set marks for the future - with the launch of Goals, a new tab now available for all users, who can leverage the site's relationships with various financial institutions and intelligent calculators to see how much money they should be saving to achieve one's life targets. And even if you opt not to sign up with new banking institutions immediately, the site's basics help you stomach the tough realities and importance of socking money away even when it seems you can't afford it. While Mint.com previewed the new Goals feature at the end of April, the tab just went live for all users, between budgets and trends. 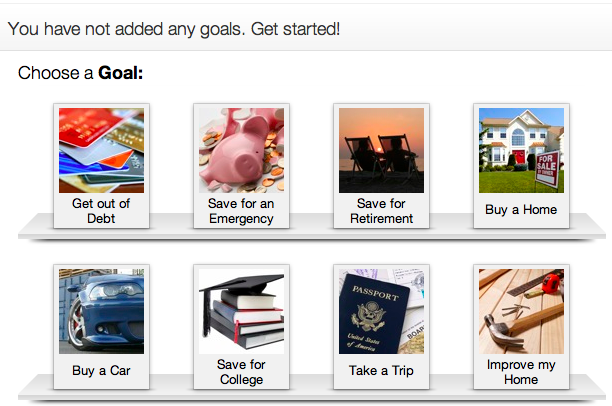 As you can expect, the site encourages you to choose from a list of preset goals, select an end date or affordable amount, and then, once saved, you can track Mint.com to see how close you are at achieving this goal. 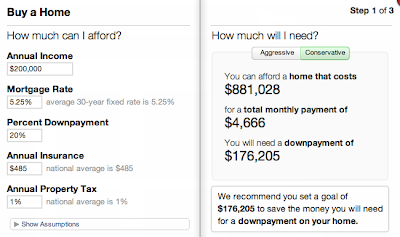 For example, when looking to buy a home, Mint.com asks your annual income, and prefills with average mortgage rates, 20% downpayment, insurance and property tax data. The more you earn, the more you can afford. It even provides "Aggressive" and "Conservative" options should you be more fiscally responsible or prefer to live dangerously. 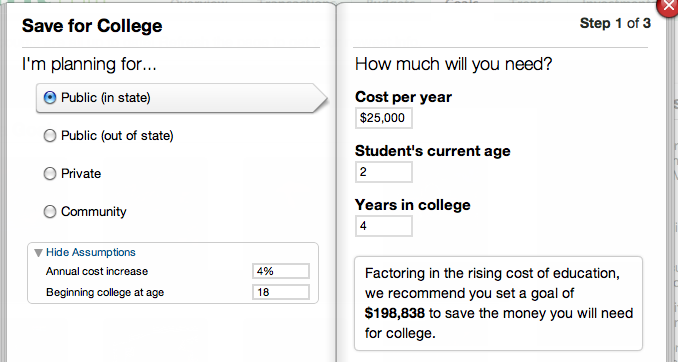 Speaking of dangerous, as a parent of twins, simply calculating college costs can be scary indeed. 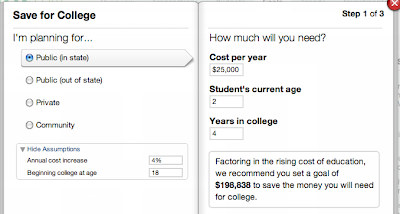 One can set estimated costs per year, the number of years the student plans to attend college, and their current age to start the calculators in motion. In fact, Mint.com says we should be saving more than a thousand dollars per month, every month, per child, to be prepared for a good school, so that is quite daunting. Luckily, they do offer a way to get a 529 plan started to help with that process. It Could Cost $200k to Save for One Kid's College. Gulp. Where I think the Goals function falls a little short is that it first, doesn't tap into your existing data on the site, as it could help you understand how much you make on average, and it also relies on you to choose how much things will cost in the future. Why not suggest prices for specific colleges, cars or geographies for instance, when buying a home? 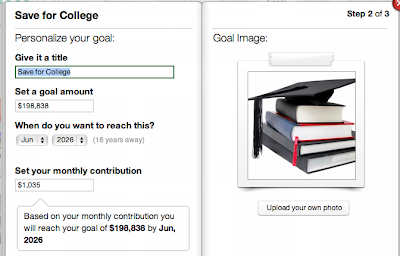 In these simple models, you say whether your child will attend a $10,000 a year university or a $30,000 one, and you decide whether you think you earn $30,000 a year, or $300,000. Mint.com, now part of Intuit, can make quite a bit of its own revenue through referrals of its customers to financial institutions that offer the very plans that make sense to achieve these goals, so in some recursive way, these goals push Mint.com's goals further forward. I do plan on investigating if it makes sense to get serious about my kids' college plans, and yes, we may even need to plan on getting one of those super cool minivans everyone is talking about once baby #3 shows up, so I'll tap Mint.com for suggestions on saving there as well. It's a goal, right? Apple Apps for Android... Could Hell Freeze Over Again? One of the major sticking points in Apple's cold war with Google is the fact that Google plays a visible role on Apple's iPhone platform, but Apple plays zero role on Google's Android platform. Google has always been the iPhone's default search engine, and Google Maps has been among the most used apps. Despite politicking from Steve Jobs and the recent inclusion of Bing as an option for iPhone's search, it is true that Apple's products are better with Google software than without. Meanwhile, Apple makes some great software - especially with their iLife suite and accompanying iTunes Store - the core of the iPhone experience and the company's entire digital media strategy. iTunes found its way to Windows. Would it ever make a leap to Android? iTunes, and its sibling iLife suite, including iMovie, iPhoto, and iDVD, were first available only for Macintosh, and were seen as a compelling reason to choose the Mac over Windows. But in 2003, Apple released iTunes for Windows, calling it, unabashedly, "The best Windows app ever". Of course, many Microsoft fans consider iTunes bloated and are not big fans, but the product does play a key role, at the very least, in backing up all those iPhones from Windows users out there, and enabling them to make purchases from the popular iTunes store. If the iPhone is a trojan horse for those who are otherwise not Apple customers, then iTunes could be the wheels that enable the horse to be pushed into Redmond's kingdom. Similarly, after Apple introduced Safari, its Web browser, in 2003, a Windows version of the application was rolled out in 2007, now supporting Windows XP, Vista and Windows 7. So Apple absolutely has a history of supporting Microsoft where it makes sense - even though they have no history of supporting Linux for these products. As an Android user now, having turned in my iPhone, I do lack the local music storage application which iTunes represented. As my life is increasingly cloud-based, this is not much of a problem, as I can tap into Sirius XM Radio or Last.fm for personalized music streams, and Spotify will no doubt come soon, as will the long-rumored Music offering from Google. But again, Apple's library of TV Shows and Videos are unavailable to Android users - many of whom may be politically opposed to Apple's products, even as others wouldn't mind firing up iTunes on Android, if it existed. Steve Jobs was famously reported to have said, angrily, during an internal meeting, that Google went after Apple in the phone business, while Apple stayed out of the search business. The company routinely displays charts that show Android as having significantly lower market share than the iPhone, even if all reports show the mobile OS catching up. Apple clearly is not a fan of Android today, and Google is said to be enemy number one. In addition to the animosity, veiled or open, between Cupertino and Mountain View, reports show that the overwhelming majority of Apple's revenue continues to be in hardware, not software. The company's Macs, iPhones, iPads and iPads are pushing money into Apple, while revenue from the App Store on iTunes is small. So unless the company wanted to display, again, that its software products are fantastic, even on Android, they probably won't go there. It's also highly unlike Apple could trojan horse any iAds into Android screens of any flavors. We Mac fans of old used to debate heatedly whether the iPod/iPhone halo effect was real, and there were many people who swore up and down that Apple should never offer the iPod or iTunes on the Windows platform, that it was giving too much respect to Microsoft, and giving away the crown jewels from Cupertino. Now, we see one platform, run by Cupertino, that is populated by enemy software, and the opposite is not true. Apple is probably going to play stubborn and avoid the Android platform unless the market demands it. If you purchase all your Web video from iTunes, having those shows and films available to your Apple TV and iPhones is pretty simple. But video from other sources, be it through camera and smartphone recordings, or even BitTorrent downloads, can sometimes be a challenge to get into the iTunes ecosystem. A simple piece of Mac software, called iVI (short for iTunes Video Importer) can bring all those videos from all those places and bring them back to iTunes, complete with cool extras, including season and episode data for TV shows, and standard or high definition content into one file. Despite Apple's success in the video downloads market, the reality is that many people still tap into peer to peer networks to get individual episodes of TV shows, or even full-length feature films. Often, even after these files are downloaded, it can be difficult to find a way to even play the files. 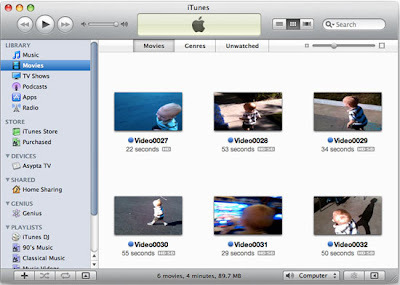 iVI converts many different file types, from the standard .mp4, mpg and .mov files to other less Mac-friendly options, including .3gp and .avi and makes them iTunes ready. Getting files to iVI is billed as being as simple as drag and drop. It recognizes if files are movies or TV episodes. Later, if instructed, it can scan for new video files in regular directories, and will go so far as to suggest TV show episode and season information if not automatically applied. Many people are turning away from the TV set and their DVRs to the computer for videos. For some, the solution is Hulu or other sanctioned outlets, while for others, BitTorrent and other networks continue to reign supreme. iVI looks like it does the hard work to make the data meaningful and get it on all those Apple devices built to play video. I've already tapped iVI to pull the 3GP files from my HTC EVO into iTunes so I could build a new iMovie project for posting to YouTube. (See Matthew Walk to the Store With Me) iVI simply works, so check it out from South Pole Software. With Digg's Kevin Rose tweeting out a rumor that Google is planning a social networking alternative to Facebook called "Google Me", the rumor mill around Mountain View is in full force. Sunday night, Chris Saad and I connected to discuss whether the Web needs a stronger alternative to Facebook, and if Google can be as strong in social as they are in more data-driven markets. Clearly, author of The Facebook Effect, David Kirkpatrick, says that they cannot, and the service's 500 million or so users are voting with their time and their clicks. As for us, we are rooting for more competition and we trust Google's approach to the Open Web as much as any other source. So listen to the podcast, about 20 minutes in length, to see if you think we are on target. 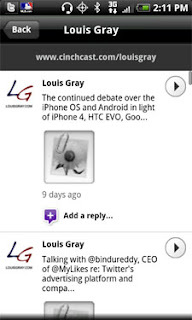 louisgray.com: Google Me This, Google Me That. Can Google Me Trump Facebook, Or Will It Fall Flat? SF Weekly: Is Google About to Launch a Facebook Killer? Kevin Rose Says So. Google Me This, Google Me That. Can Google Me Trump Facebook, Or Will It Fall Flat? Tomorrow's Web seems to be shaping up for a battle between two major players - Facebook and Google, with Apple and Microsoft holding down their own tangential fiefdoms, and smaller services, like Twitter and LinkedIn, chugging away with their utility-like products. Make no mistake of it - while there is room for innovation and success at these smaller levels, Facebook's goal is to own as much of the Web as they can, and Google would like to make sure they don't. An open Web, however you define it, is good for Google, presenting a myriad of opportunities for search ads everywhere, while a Facebook-controlled universe is not. And the latest rumors, spawning from a simple update by Digg's Kevin Rose hinting at a direct Facebook competitor, dubbed Google Me, have people wondering if Mountain View is preparing another major assault aimed to keep Zuckerberg and crew off the top pedestal. Google's ventures into the social realm, thus far, have been less successful than their more data-centric programs. The idea that Google is all brain and no heart seems to follow the search giant around the Web, echoed by David Kirpatrick in The Facebook Effect, and the many naysayers who point to the slow development of Google Wave and initial stumbles of Google Buzz as proof that Google can't do social, making a new attempt, no matter how thorough, ripe for instant punditry aiming to be the first to claim its demise. As someone who has watched the launch and growth of Buzz closely, what has been clear from the beginning are two major things relevant to the new discussion. First, the company never said this was a Twitter or Facebook competitor. They were clear to separate Buzz from being a challenger to those social titans. Second, the company has been banging the drum on open standards, from Activity Streams to Pubsubhubbub, Salmon, OAuth and many others. In the meantime, in the wake of former Blogger product manager Rick Klau joining the Google Profiles team, I talked about ten ways the Google Profile could be improved, and later, how Google could tag team Profiles with Buzz, and its myriad of other social objects, and battle for your ID against Facebook. Even if Google's social solution is not fully baked yet, we can watch it cook, and we know many of its ingredients already. For those saying Google Buzz has not met expectations, or in more strong terms, that it has failed, I can't say that I agree. I have heard anecdotal comments that Sergey Brin is especially focused on making sure Buzz is a success, and I have personally seen the breadth of the team working on the project, in an area on campus that requires a second level of clearance beyond the standard Google employee's badge. Whether Buzz remains the flagship social item for Google or becomes a key ingredient into a real bona fide Facebook competitor remains to be seen, but I see Buzz as the parallel for the newsfeed popularized first by FriendFeed, and later, folded in as the most visible part of Facebook today. You've also seen previous rumors of Google looking for a head of Social, whatever that job entails. For a company who is driven by data over emotion, it seems they are fighting for the future of the Web against their blue-toned brethren, many of whom used to be Google employees. It's also widely known that if you do work for Google and announce you are leaving to join Facebook, you are whisked out of the building faster than a hoodie gathers nervous sweat. The tension between the two companies is very real. The question becomes then, can Google, or anyone, provide a social environment that is attractive enough to get users to sign up en masse, or to change their behavior away from Facebook? Facebook's origins, based on a true identity, have helped connect people with former school peers, family members around the world, colleagues, and yes, complete strangers. To rebuild one's social graph is hard to do, even if Google has a ton of data on you and who you like to connect with and follow. It could be that this is a valiant attempt, with incredible technology that solves a problem which for the most part is lacking. I am not hearing my mainstream relatives who don't drink tech for a living say they want to leave Facebook. They are happy with a blog to communicate together and Facebook for more casual updates. I don't know if Google Me exists or not. I would not be surprised if it does, but I also would not be surprised if this simply relates to the continued evolution of Profiles, with Klau and team on watch. Google didn't hire Chris Messina and Joseph Smarr and Brett Slatkin and Brad Fitzpatrick and Don Dodge just to keep them away from Microsoft, Facebook, Twitter and others. They brought these guys, and many more, on to make something happen. No matter what does happen, there's no question that social Web participants will benefit with more options and opportunities. Who knows? Maybe Google can set the Web on its collective ear again like they did with the introduction of GMail. I for one will never count them out. For just about any topic or choice, there comes pressure to take a side, to align yourself with a group who can reinforce that your choice was the right one, and any alternative choice is somehow wrong or inferior. Even when choices, be they politics, sports or technology, are very similar, the differences are magnified, and camps are erected to defend one's position. 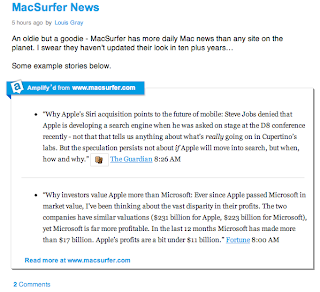 It plays out every day in my RSS feeds and social streams, as you see a battle between Mac and PC, Facebook and Twitter or Buzz, Android versus iPhone. One's preferences even go so far as to define who you are, and who chooses to follow you, as most people would rather see their own viewpoints reinforced than gain insight into a differentiated position. As technology improves, I've found the need to become entrenched and ready for Holy War, setting out to convert the unbelievers, is decreasing. For the most part, the leaders in any market are "good enough" for most needs, or the #1 property is clearly the best, and most all people are there. So I have been working to make my choices based on my own experiences, not rhetoric, data over emotion, and have increasingly made it easier to migrate data and profiles should the time come that I needed to switch. It's enough to make my former would-be tattooed with the Apple logo soul turn over in its grave. Where I once gave Tips on Being an Apple Fanboy, I later spun up Windows 7 and found it to be pretty good, and I even turned my back on iPhone after finding the Android platform was a better fit for me. Just yesterday I sold back my iPhone 3G to Sprint and got a new HTC Hero for my wife so she too can be off the platform, and off AT&T. I do not care what Web browser you use. I still harbor some disbelief that anybody uses IE, of course, but Firefox, Chrome and Safari are all good options. If you run Mac OS X or Linux or Windows 7, you are making an effort to be cutting edge. If you are rocking a BlackBerry or an Android or the newest model iPhones, you are probably on the right path. So good for you! I may have my personal preferences for "right now", based on my own insight, but the way I use technology is not the same way you do. The fact that I can tease out 10 to 20+ hours of battery life on my HTC EVO, but many notable bloggers can't doesn't make them wrong or mean I am lying. It's just a difference of use, and good tweaking on my part. I do not care if you prefer Twitter to Facebook or LinkedIn, so long as you are getting what you want out of each service, and that it is serving you well. I may use them less than I use Google Buzz or FriendFeed today, but that doesn't mean I need to constantly play the role of evangelist to push you into agreeing with me. And I really don't care if you like WordPress or Posterous or Tumblr to my Blogger. That's your choice. Good for you. So yesterday, when I did announce my finally moving off iPhone to Android, I got some response from around the Web saying I made the wrong choice, that I didn't understand how amazingly awesome the iPhone 4 was. Maybe, in a previous year, I would have been among the others saying the same. But now, I've decided I'll try new things and make a decision based on my experience, rather than going ahead in one way just because I always have. When I first tried the demo EVO from Google I/O, I was nervous with it, the same way I was the first time I sat in front of a Windows NT machine, expected to go to work. I didn't know if my experience would suffer, or I would be missing something. But, as you know, I found it to be quite good, and in the Bay Area, the quality of Sprint over AT&T was a major push for us to consider an alternative, after our family has spent hundreds of dollars each month to get less than acceptable service. You know what my biases and preferences are. I'll talk about them here, and you can see me vote with my own activity. Maybe I'll convince you to like the same things I do. But I am working to shed any drooling fanboy label, and demonstrate an open mind. So do show me what you know that I don't. Introduce me to services and platforms I've never seen. It's a great time to be a tech consumer. With so much data being created online from so many different sources, human curators are becoming increasingly important - separating high quality content from low quality content, and becoming trusted sources of data for the extended social graph. At the beginning of June, I gained the opportunity to talk with Ed Callan on the topic of curation, and how I go use many different services online, from Google Reader, FriendFeed, Delicious, Twitter and Facebook, to other tools, including my6sense and CinchCast. The extended interview is very detailed and explains, in near entirety, how I interact with the Web each day. While the topic is curation, Ed and I expand well beyond the core, and into more biographical detail, and the psychology of social media users. I hope you find it of value. Of note: The call was part of a one-hour paid engagement unrelated to any company I advise or my core job at Paladin. My6sense, a Paladin client, is highlighted, thanks to the topic of the call. I did not know the call was being recorded, but as it is, I am sharing. This morning at the Churchill Club in Mountain View, David Kirkpatrick, author of the Facebook Effect, which chronicles the ascension of the world's largest social network, based on significant access to the company's youthful, and often controversial, CEO, spoke with All Things Digital's Kara Swisher about the book, and his thoughts on the company. Kirkpatrick, who did not wear a hoodie, and did not break out in a sweat despite focused questioning from Swisher, said Facebook, despite its rapid growth, was focused on maintaining its company culture, and he hypothesized they might even look to delay going public to avoid "big company syndrome." Meanwhile, he said Zuckerberg doesn't "have to ask permission for anything", giving him "total control." At times, Kirkpatrick seemed in deep awe of Zuckerberg and Facebook's mission, vigorously defending the company's march to create a platform based on genuine identity. He argued that most Facebook users "didn't care" about the network's privacy stumbles, and called for companies to integrate Facebook functionality in their own Web sites - even as he admitted that for his own account, he locks down his profile as much as possible, and even railed that others can tag photos of you without your initial approval, saying he was "offended" it could be distributed to friends without his go-ahead. His infatuation with Zuckerberg began when he was a writer for Fortune, and reached a full-time obsession in fall of 2008 when he left the magazine to write the book. He now speaks of being immersed in the world of Facebook. "From the very first lunch I had with him, I had a sense, it was a very different phenomenon," Kirkpatrick said of Zuckerberg. "Meeting him and seeing the way he talked about this thing like a lifetime project about changing the world struck me rather strongly." Kirkpatrick sees Facebook as having succeeded through being a blank slate for its members, not limited to specific niches, and through being nimble, constantly making moves to stay ahead of competition, and often making strategic redirections that run contrary to the wishes of its own members. For this, unsurprisingly, he again credits Zuckerberg, and his ability to attract and almost cult-like acceptance of his message. "It's still an aggressive, entrepreneurial, young, excited, committed culture," he said of Facebook. "Mark is a person of substantial vision, and for one way or another, he has succeeded in indoctrinating a very large number of people to feel the same way about the mission Facebook is on. Vexingly, it's not about the same things that most businesses are about." If this line of being dissimilar to traditional businesses and being measured in a new light sounds familiar, it is because it should. It's not too dissimilar to that echoed by Google in the run-up to their IPO in 2004, and their messaging subsequently. But Kirkpatrick said the move to go public changed Google a lot, and he believes if Zuckerberg had his way, Facebook would never enter the public markets, despite the fact the company respects Google a great deal and has hired many people from Mountain View to join their team of more than 1,400. Strategic moves such as stopping the issue of stock options to new employees, in exchange for Restricted Stock Units (RSUs) and the sale of hundreds of millions of Facebook stock to Russia-based DST, have kept the number of primary stockholders low, and delayed what many think is the inevitable. All this work to remain private, and to remain a tight culture, is yes, about control, Kirkpatrick made clear. He criticized those who would try and question Zuckerberg's methods and motives for starting Facebook, including whether or not he may have famously stolen ideas from the Winkelvoss Brothers in his time at Harvard. "In the United States, we have a hubristic desire to bring down the powerful, and Mark is the biggest target," Kirkpatrick said. "There is a rabid culture of gotcha journalism and blogging and punditry, particularly in tech. The bigger Facebook got, the more people wanted to think he stole the idea. I don't think it's entirely unjustified, but far more has been made of it than necessary." Without setting himself up as a pundit, given his "poking" of the general tech press, Kirkpatrick did slam Facebook's handling of the privacy crisis and other changes, calling the communications "egregiously abysmal". But he said Facebook would be wrong to listen to its users, as it would have been bullied into rolling back core functionality, including some of its most popular features. He said, instead, that Facebook knows best, that it is both people-centric and data centric, and that the data is continuously studied. He predicted Zuckerberg plans to lead the company for the next decade, and that it will hit a billion users by the end of 2011 - an incredible number, with Mark in control. 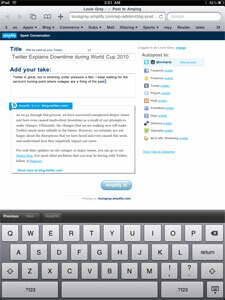 Padding on to my comments about mobile WiFi being a must-have for mobile consultants, another indispensable product I have turned to in recent months is Tungle, or more specifically, Tungle.me, which lets me open up my calendar enough so third parties can book time with me on my schedule, without having to worry about who is using different systems, or giving away private information, such as just who I am meeting with when. Now, instead of having unproductive e-mail sessions where people try and find out what times I am open, I just point them to my Tungle, and more often than not, assuming the time is open, a meeting can easily get booked. The fragmentation of one's calendar can become ever more possible as one starts to work with different companies and their own internal calendaring systems. As you can guess, even if I meticulously watch over my Google Calendar (or iCal, if you prefer), meeting invites come in on corporate e-mail via Exchange, or through client e-mails. As far as their Exchange servers are concerned, almost all my time is free, even if that is far from the case. This is due to Google Calendar and iCal not having write access to their servers. 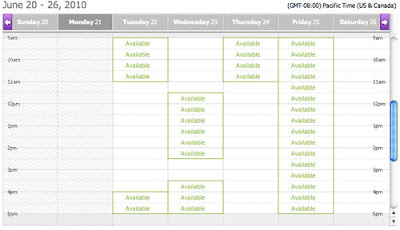 By making Tungle the master, I can synchronize with Google Calendar, and report free/busy to the world, but I can also ask people to schedule meetings through their service, and can browse their free/busy schedule, with their permission. 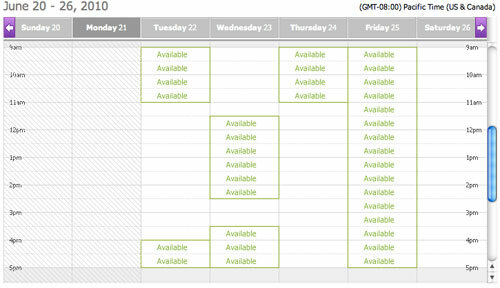 I have set up my Tungle such that when people propose new meetings, they need to select more than one time that works. This gives me a chance to reference my Tungle to actual locations of meetings (known from Google Calendar), and to pick the best time or date. Upon acceptance, Tungle sends an e-mail to both the contact and myself to provide an update, and Tungle writes back to my Google Calendar to correctly show the meeting is reserved. I don't have to post it in more than one place, and Tungle goes so far as to set an alarm to remind me when the meeting approaches. How one manages their calendar differs for each person of course. As you might not want somebody to assume you are really "Available" when you had planned to get work done, you can still use Tungle (or whatever calendar you use to feed it) to block out hours for tasks, or you can leave the time open for net new meetings and simply move your tasks around. Regardless of your choice, Tungle also helpfully provides a feed of all changes to your schedule, chronologically, to show updates you have made, and those others have made to you. The leading words in today's Web are about flexibility, choice, openness and mobile. Tungle doesn't force me to choose one calendaring system over another, and it displays the content I choose to whomever I like. 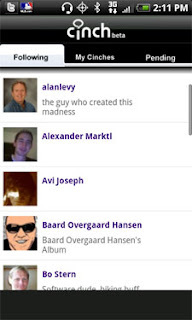 It also offers a mobile app for iPhones and Blackberries, though Android support, thus far, is lacking. You can find my Tungle at http://tungle.me/louisgray. I also included Tungle in my recent 50 Top Startups Worth Watching at position #38. One of the quirks of being a full-time consultant is scheduling one's day with multiple clients in multiple locations, with multiple technology environments. Just as one might consider who they are meeting with when selecting a morning's outfit, one also has to think about which offices have which capabilities, and just which devices or cables should be carried. Oftentimes, thanks to security reasons, or simply imperfect setups, a company's wireless network (or an alternative network) is not available to third parties. While in the past, that would mean working "without a net", one can now bring WiFi with them, through MiFi cards, portable wireless hubs, or mobile WiFi capabilities on leading smartphones. For me, the new capability has greatly increased my productivity at client sites where previously I've felt like a second class citizen. The opportunity to use my HTC EVO device, powered by Sprint, as a mobile hotspot, has, for me, further widened the mental gulf between it and its comparable cousin in the iPhone family, even as the newest offering doesn't allow for wireless hotspotting unless you jailbreak the device. Even for those who find Apple's offering superior, the iPhone cannot deliver for me while the EVO does. While speeds over the EVO's 3G (or 4G) network are not as fast as standard 802.11 based connections, the mere opportunity to get on the Web, rather than sitting dumbly or asking for the client to look at a Web site on their computer, is a lifesaver - and no doubt is worth the $30 a month it takes to enable the functionality in addition to standard Sprint service. As more people are turning to consulting roles, or hoping to bring value to partners, one should not always expect free unencumbered WiFi available. While yes, it's fun to turn the phone into a Hotspot and enable Wireless access to the whole family while riding in the car, it's actually bringing the Web to clients that makes the feature a requirement. So Apple, if you want to be considered as a real corporate solution, you have to bring this functionality soon, or you're not even an option. My Laptop Loves Being Connected. Batteries Don't Measure Up. Just over a decade ago, Apple ushered in the wireless networking phenomenon with their new iBook consumer laptop, and accompanying Airport base station. Prior to that, Web access always required a hard-wired connection, be it through Ethernet cables or modems. Today, WiFi has practically become ubiquitous, a must-have for any new computer purchase, and one assumes it available in many homes and commercial buildings. Yet we continue to lug along with us a wide array of cords and connectors for all our devices, be they tablets, laptops or mobile phones - not for networking, but for power. The more powerful our devices have become, and the more capable they are, they seem to be just as hungry as ever in terms of sucking down electricity, no matter the manufacturer, no matter the OS and no matter the model. Back in early 2007, when this blog was in its infancy, I said it was time to make power wireless and battery-free. 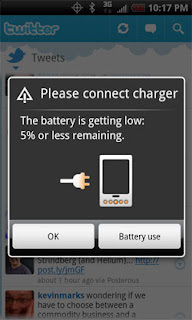 While PowerMat has some solutions for mobile handhelds, the tipping point has not yet occurred where we can trust our batteries to run for days, and continue working after hours of peak load. And despite the occasional talk of new solutions that harness kinetic energy, solar energy or something else entirely, there have been no notable revolutions in this area that change the game. Last week, Michael Arrington of TechCrunch aggressively said the HTC EVO was "seriously flawed" and said not to buy the phone - the same I've been using since Google I/O. One major reason cited was the battery life. It's the major knock against the device I hear in most reviews. My experience hasn't been so brutal, but it, like the iPhone before it, and my laptops, and every digital device I've used, has required me to bring power along, for fear of going dark. In fact, practically the only mainstream computing device I've used that has a battery to be celebrated is the iPad. Whatever Steve Jobs and team did to get that bad boy up and running for a few days is fantastic - but it is the exception, not the rule. When using the EVO or iPhone or laptop, I plug in whenever possible. It's become as old hat as hitting Save every few minutes any time I use a Microsoft application. Old habits die hard. Today, I chose to use the EVO as I have been, but to keep it unplugged and let it run down to zero. Turns out, despite warnings out there that it's toast after about three hours, it was unplugged for more than 9 hours before spouting warnings, and I can't even guarantee it was full when I started. Interestingly enough, the EVO (and other Android phones, I assume) features the option to find out just what it is that is driving the battery downward. 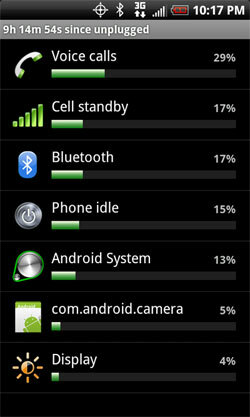 What's Consuming My Battery Anyway? According to the device, the hours of phone calls I made sapped 29% of the battery. Cell standby took another 17%, Bluetooth 17%, 15% for idling, and 13% for the Android OS itself. Good to know. But even though I had made hours of calls, and other activity on the device, it rivaled my experience with the last generation iPhone, which similarly was notorious for draining the battery, whether I used it or not. And while many people have pointed to needing to use a Task Killer to reduce drain on the EVO, Apple's helpful guide on preserving iPhone battery life isn't all that different - saying to fetch data less frequently, avoid Push notifications, or even to go into Airplane mode whenever possible! Needless to say, companies like Apple wouldn't have to go into such details about preserving battery life if the phones were designed for always-on behavior. Meanwhile, laptop batteries are about the same they were more than a decade ago. In 1998, Apple introduced the PowerBook G3, claiming five hours of battery life, ostensibly enough to watch a DVD through fully, twice. The newest Apple MacBook Pros say they can last from eight to ten hours, though I don't know of many people who can claim having reached that threshold. So in 12 years, assuming truth in marketing, battery life has improved about 60-80 percent, while Internet speeds have improved much more dramatically, and CPUs have morphed from hundreds of megahertz to a few gigahertz. Batteries continue to lag the market, relative to most other measures. It seems the best way to preserve battery life on laptops or mobile phones is to simply not use the devices or reduce activity on those devices. But today's machines are being built for multi-tasking, and for ever-increasing demands via Web browsers and high octane Office or rich media editing apps. I'm happy we're now seeing the first real products that leverage wireless power, but they are so limited as to not even be intriguing to this early adopter. 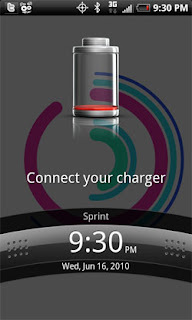 I want real wireless power, just like 802.11, or I want an alternative that lets me charge up on the go, without cords. In this case, it's not about jousting between phone models, it's about making the same leap we did in networking. Fewer wires. More functionality. How can we get there? Since switching to Android from iPhone in an extended trial, there have been few applications that I've sorely missed on the new platform. 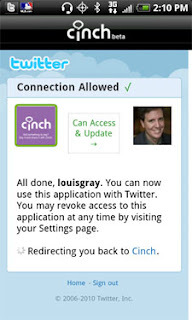 Topping the list of app vacancies has been Cinch, from BlogTalkRadio. On multiple occasions since the switch, I've found opportunities where I wish I could just fire up the app and do an on the spot interview, only to be left wanting. And my opinion is not the only one. At a recent dinner, I asked Robert Scoble what app he missed most on Android, and he too answered, "Cinch". Luckily for us both, and for the many people who like Cinch and Android, that gap was filled today, as the simple podcast recorder and directory entered the Android Marketplace. Just like its iPhone app sibling, Cinch for Android lets you record podcasts simply by opening the app, pressing the record button, and when done, publishing. You can customize the podcast with a title (under the magically familiar 140 character limit), a photo, and can simultaneously update the CinchCast site as well as Twitter and Facebook, should you so choose. The Cinch app is free in the Android marketplace. While the debate can still rage over what OS is better, or what handsets are the greatest, having top-quality apps on both sides of the aisle is beneficial to all. Now, I just have to hope Redfin, eTrade and my6sense show up soon to make my phone complete. 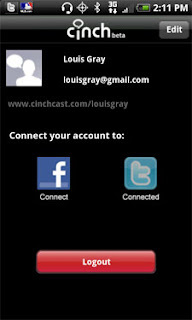 You can find me on Cinch at http://www.cinchcast.com/louisgray. As the debate around Android vs. iPhone continues to rage, I took time to visit the new Qik studio, and sit down with Daniel Brusilovsky (@danielbru), a marketing manager at the company, who is also the founder of Teens In Tech (where I am an advisor), to talk about why I've stopped using my iPhone, and why even the new iPhone 4 isn't enough to have me going back to Apple, instead of Android. As I've discussed many times, the trajectory in mobile seems to be heading toward Android, and I don't want to be limited to my choice of handsets and carriers. More, in full, below. With the world of Web pages turning to a Web of streams, there becomes a battle to find value in those streams and capture points in time, sharing with your social graph. 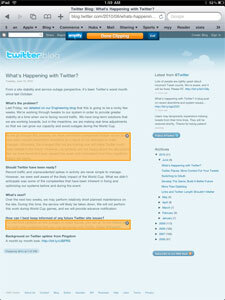 Between the medium of full-length blogging and more instantaneous tweeting or status updates is forming a lightweight medium, featuring products like Tumblr, Posterous and an intriguing entrant, Amplify, which is built to let its members post short updates, engage with the community and more importantly, clip favorite pages or Web sites along the way for discussion. Showing steady traffic and user growth over the last year, Amplify is now branching out to mobile devices with a mobile bookmarklet, letting you post updates from your iPhone, iPad or Android handset. One of the biggest drawbacks of surfing the Web on an iPad for me is the consistent reminder that its user agent tells downstream sites that it is a mobile device, and not a full-fledged computer, bringing me mobile versions of favorites like Google Reader and Twitter, for instance. 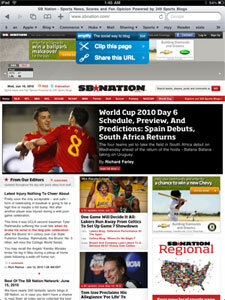 Similarly, some site's widgets and bookmarklets don't behave in a standard way. But Amplify's new code is built to take advantage of the new world of advanced mobile devices and touch screens. 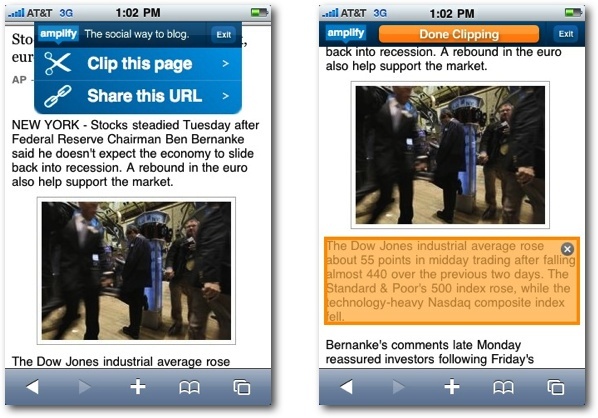 As with other Bookmarklet-driven services, Amplify offers you the option to share the URL and make notes about that share, which are added to your dedicated page. 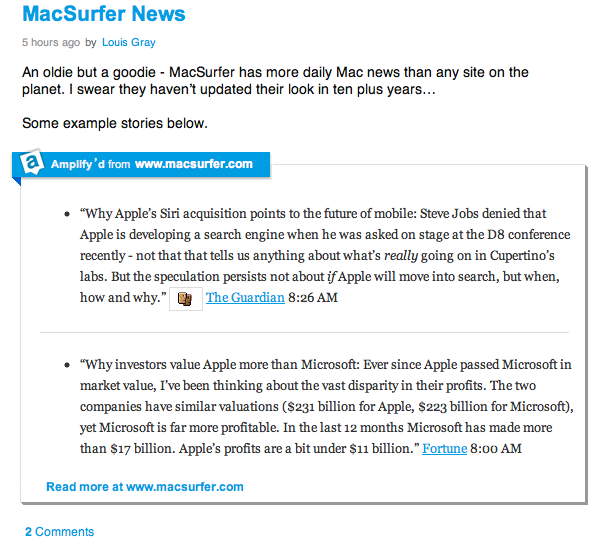 For example, my own feed is here: http://louisgray.amplify.com/. You can also "clip" from the shared page, which grabs not just selected text, but even graphics included, just as if you had clipped a newspaper or magazine article - which is very nice. For example, last night, when I shared Twitter's latest post about uptime struggles on Amplify Mobile, I was prompted to clip the article, tapped twice with my finger on paragraphs I wanted to include, and Amplify went above the call of duty to include the links to the company's Status blog and @Support. The resulting share (here) is displayed elegantly and captures downstream impact of likes, comments and retweets from the community. Amplify's mobile solution doesn't have to be a dedicated iPhone or Android app - and mobile clipping promises to be the beginning of their off-desktop strategy. But it absolutely works great, and it seems they have an engaged community looking to see what you share. If you're an active bookmarker on Delicious, or have previously enjoyed using Bookmarklets on FriendFeed and other services, Amplify is very interesting indeed. You can of course connect to your extended social graph from Twitter and Facebook, so make sure you're not Amplifying the news alone. I'm here: http://louisgray.amplify.com/. A truly brilliant Web service is one that impacts your life offline, and can change your life for the better. While there are many different Web sites considered must-visits practically every day, there are other vertical apps which can be especially important for a brief period of your life - such as those, for example, based around health issues, graduate test prep, or prenatal planning. In our home in the last few months, in companion with Mint.com, no single service has been more important, nor more heavily utilized and debated, than Redfin.com (and its associated iPhone app). As we anticipate our third child in a few months, we've known we need to move to a bigger place, and we have done almost all our research and comparisons through Redfin. 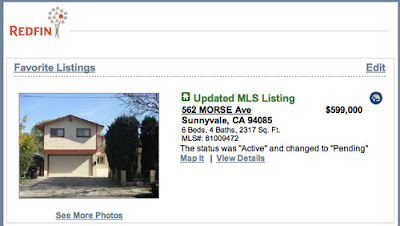 Essentially, if the activity isn't displayed on Redfin, we assume it doesn't exist. While there are no doubt many different real estate search sites on the Web, Redfin came well recommended by peers, and in my own comparisons, I often found that Redfin data was more recent and more accurate than others, such as Zillow.com, despite the fact that both services (and many others) pull from the same sources. As a family looking to get a better home, but not being uber-rich, which would come in handy here in the high-priced Bay Area, my wife and I had to determine several things, including those factors which we determined were important to us, including location, size of the home, number of bedrooms, the type of backyard, size of the yard, and quality of nearby schools. Meanwhile, as I played with Excel to try and figure out just how much we could afford, I started dabbling with Redfin to find potential homes and stow them away in my favorites. This dabbling soon became a full-time hobby. For the last three months, I've scoured the Peninsula for homes that made sense for us. If I thought they were a candidate, I hit favorite. I could sort by price, sort by the size of the home, eliminate those that didn't meet criteria, and find which ones had upcoming open houses. 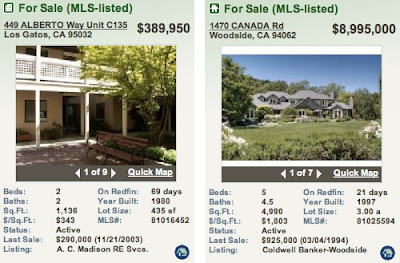 Meanwhile, Redin.com has been sending me updates by e-mail overnight to catch me up in case prices change, those on my watchlist saw sales pending, or if open houses were planned or canceled. One Update from Redfin via E-mail. Redfin has become my hub for the entire search, and has been so effective that my wife and I haven't looked anywhere else. Every home we have looked at, we previously previewed on Redfin and had the specs memorized before we went through the front door. And after every visit, we went back to Redfin to make changes to our list. Knock on wood, this search looks to be soon coming to an end, hopefully. As my wife's not getting any less pregnant, and the buyer of our condo is entering the homestretch on his approvals and paperwork, I hope we start planning the moving phase, and dealing with that major headache. Redfin.com is not available in all areas, focusing on a number of select metropolitan areas - which, obviously, the San Francisco Bay Area is one. 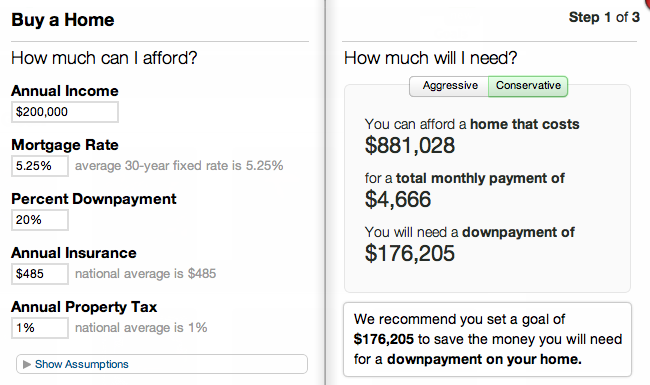 As somebody who prefers to leverage the Web for practically everything I possibly can, it's been awesome to have a strong silent partner like Redfin.com doing all the hard work of looking around for me and letting me know exactly how much I would have to pay each month, or in property taxes, or even how the price of potential homes has changed over the last few years. 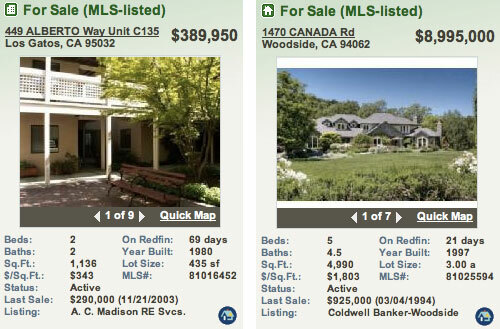 I love playing with data, and Redfin has a ton of it. If you are thinking of moving or selling your place, and Redfin.com is in your area, I can't see why you would go it alone.